The HETS office wants to congratulate Dr. Jerón­imo Domínguez; vice provost of Extended Uni­ver­sity and HETS Designated Representative at the Uni­ver­sity of New Mex­ico; for his recent achievement, the receipt of the 2012 Distance Learning in Higher Education Award. Jerón­imo Domínguez, vice provost of Extended Uni­ver­sity at the Uni­ver­sity of New Mex­ico, has been selected to receive the Dis­tance Learn­ing in Higher Edu­ca­tion Award, pre­sented by the Amer­i­can Asso­ci­a­tion of His­pan­ics in Higher Edu­ca­tion (AAHHE) at the AAHHE 7th annual con­fer­ence in Costa Mesa, Calif.
Domínguez was selected by a panel of experts in higher edu­ca­tion. The selec­tion cri­te­ria focused on the recipient’s sus­tained con­tri­bu­tions and efforts to show­case the sig­nif­i­cant accom­plish­ments this award rep­re­sents. This award is given to an indi­vid­ual who has cham­pi­oned dis­tance learn­ing in higher edu­ca­tion via online instruc­tion, research or the devel­op­ment of dis­tance learn­ing processes that impact Latino stu­dents in higher education. “Dr. Domínguez’s work and ded­i­ca­tion to pro­vid­ing access to stu­dents via dis­tance learn­ing, adds value and accel­er­ates our stu­dents’ abil­ity to com­plete their degree. He is a pio­neer in the dis­tance learn­ing model of instruc­tional deliv­ery,” said Loui Oli­vas, pres­i­dent, AAHHE. “In New Mex­ico, a largely rural, minority/majority state, where His­pan­ics com­prise 46 per­cent of the state’s pop­u­la­tion and, at the Uni­ver­sity of New Mex­ico where His­panic under­grad­u­ates com­prise 42 per­cent of the stu­dent body, I am hon­ored to be rec­og­nized by AAHHE as the recip­i­ent of the 2012 Dis­tance Learn­ing in Higher Edu­ca­tion award. The abil­ity to access UNM pro­grams and courses via tech­nol­ogy is crit­i­cal to New Mexico’s pop­u­la­tion. 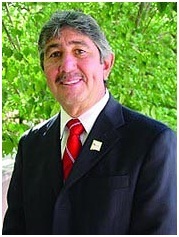 Dis­tance edu­ca­tion is mak­ing a dif­fer­ence for many New Mex­i­can dis­tance learn­ers,” Domínguez said.